Do you know the first names of the people in this photograph? 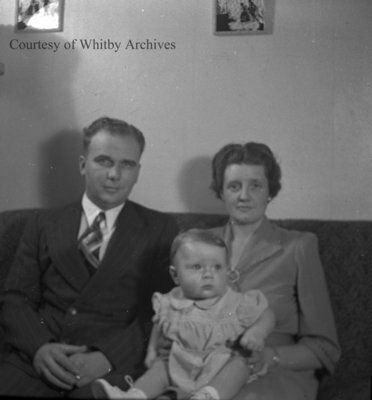 A black and white medium format negative of the Bush family taken on January 7, 1945. In this view Mr. and Mrs. Bush are sitting on a couch. Mrs. Bush is hold a baby. Bush Family, January 7, 1945, Marjorie Ruddy. Whitby Archives A2013_040_602.